Is it safe to touch a ladder or a person that's in contact with a power line? Why can bids sit on power lines and not get hurt? Why do we have to keep our kites out of power lines? These and other questions are answered at our electric safety demonstration. 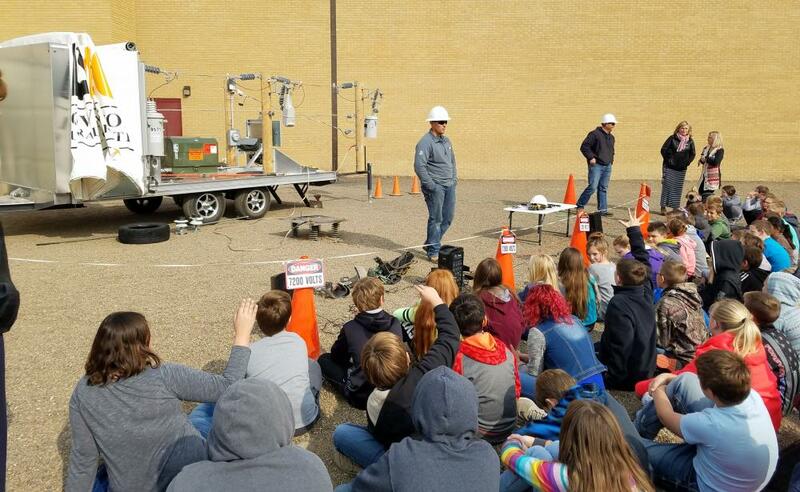 This homemade high voltage safety trailer is used to demonstrate the dangers of contacting overhead and underground electrical lines and electrical equipment attached to those lines. LYREC has presented the safety demonstration at our annual meetings, grade schools, Ag Days, Richland County Fair, and hosted a community night for the public at the LYREC headquarters. The attendees witnessed the flash of an electrical arc, electrical faults, and other dangerous situations, and how to avoid them. Our demonstrations are excellent for schools, civic groups, and for any emergency response personal. LYREC's goal is to stay actively involved in the safety and welfare of our community. Our demonstrations are designed to educate our members of the hazards of living and working in the presence of electrical power lines. If you would like more information regarding the safety demonstration or would like to schedule a safety demonstration for a group, contact Jami at jamip@lyrec.com or 406-488-1602.